A new schema option to control the maximum image display size (default 800 pixels), larger images are sampled to be within this limit. This is to prevent Cradle consuming large amounts of memory when large numbers of items containing large images are shown in views. Cradle-6.8.1 is an update release for Cradle-6.8 and so, by definition, it does not include any database format changes from Cradle-6.8. There were database format changes between Cradle-6.7 and Cradle-6.8 and so if you migrate to Cradle-6.8.1 from a release before Cradle-6.8, such as Cradle-6.7, 6.6, 6.5.1, 6.5, 6.4.1 or 6.4, then you must convert all of your databases to the new format. If you install Cradle-6.8.1 over your existing Cradle installation (that is, you install it in the same directory as your current Cradle system), then the Cradle-6.8.1 installers will automatically detect which of the converters need to be run, ensuring that your upgrade is as simple as possible. Please be advised that in Cradle-6.0 we changed the internal representation of text inside frames, so that it better supports the concept of paragraphs and is far less based on the concept of text being a list of lines. This means that the database converter for Cradle-6.0, the executable cvt_5760.exe, performs some text manipulations as part of the database conversion. If you export from Cradle-5.7 and import into Cradle-6.8.1, then these text manipulations will not occur. You may therefore find a difference between a database conversion and an export followed by an import. Cradle-6.8.1 is a small update to Cradle-6.8, but both Cradle-6.8.1 and Cradle-6.8 are a major improvement over Cradle-6.7 and are a very major improvement over Cradle-6.6 and previous versions. We would like you to use Cradle-6.8.1 instead of Cradle-6.7 or any earlier version. That is why we released it! If you are using Cradle-6.8, then please consult the Cradle-6.8.1 release notes to see if any of the enhancements or bug fixes are relevant to you. If 3SL knows that you need some of the changes in Cradle-6.8.1, for example to be able to perform operations that you have told us are very important to you, then we will have already told you to download and install this update. If you are currently using Cradle-6.5.1 or an earlier version, then we very strongly recommend that you upgrade directly to Cradle-6.8.1 (ignoring Cradle-6.6 and Cradle-6.7) as Cradle-6.8.1 is a very substantial improvement to Cradle-6.5.1. You cannot mix Cradle-6.8.1 or Cradle-6.8 with any earlier release of Cradle, but you can combine Cradle-6.8.1 and Cradle-6.8. This means that if you decide to install Cradle-6.8.1 or Cradle-6.8 anywhere, then you must install one of these releases everywhere. These incompatibilities are failsafe. That is, if you accidentally fail to upgrade a client to either Cradle-6.8.1 or Cradle-6.8 then starting that client will not adversely affect the operation of Cradle-6.8.1 or Cradle-6.8, since the Cradle-6.8.1 and Cradle-6.8 servers will ignore connection attempts from clients of any previous version. If you have Cradle-6.8 you do not need to upgrade the Cradle server to Cradle-6.8.1. You can leave the server at Cradle-6.8 and upgrade some or all of your clients to Cradle-6.8.1. may download, install and use Cradle-6.8.1, even though the absence of maintenance for such products means that they will not be able to migrate automatically to the next major release. 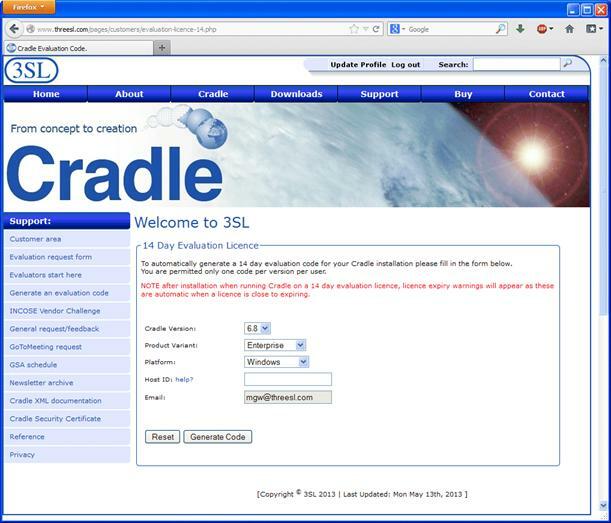 Cradle-6.8.1 and Cradle-6.8 uses different Security Codes to all previous versions. Before you can install either Cradle-6.8.1 or Cradle-6.8, you will need to request a new Security Code. Cradle-6.8.1 and Cradle-6.8 Security Codes will only be provided to customers who have the multi-user Cradle Enterprise product and an active maintenance agreement with 3SL or one of our partners and distributors. Such customers can also download a temporary Cradle-6.8.1 Security Code directly from our website. These codes last for 40 days. For further information, visit the 3SL website, login, and visit the Customer part of the Support area within the site. All Cradle-6.8.1 download files for Windows and Linux/UNIX were added to our website and to our mirror site on 10th May 2013. Note that Cradle-6.8.1 is a 32-bit application. It will run on 32-bit and 64-bit Windows platforms, including Vista, 7 and Windows 8, although we will not officially support Windows 8 until the next release. However, Cradle-6.8.1 does not support 64-bit versions of Microsoft Office, and specifically Cradle-6.8.1 does not support 64-bit Office 2010. If your Cradle system is earlier than Cradle-6.8 and includes named user licences, then you will need a new named_users file from 3SL for these named users in Cradle-6.8 and Cradle-6.8.1 because the named_users file is also linked to a particular Cradle version. You should receive this file automatically, but if you do not then please request it from 3SL. Please note that Cradle-6.8 and Cradle-6.8.1 are not opportunities for you to change the user names encoded in a named_users file. You can change these user names either when you renew your Cradle maintenance or if you purchase new Cradle licences.